My turn to go into work early this morning. One of the benefits is seeing the sun rise. 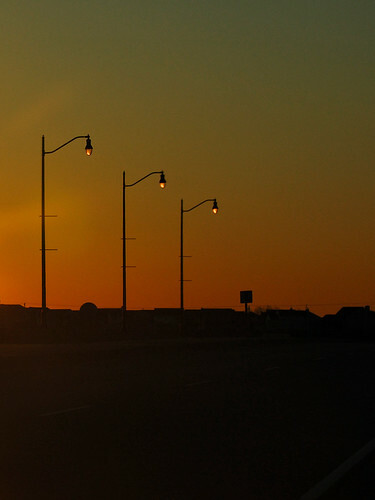 Today's sunrise picture taken on the Interstate overpass. The fancy lights were erected not too long ago. Today's weather was gorgeous - our first real Spring day. Erica departed after lunch for church retreat in Indy. I spent the afternoon cleaning out the fish pond and had a nice steak dinner planned when Scott suggested we eat out. We were headed for Za's, but then decided that the Sonic might be a better choice - we could eat in the convertible (the top was down, of course) and enjoy the warm spring breeze. It was a great decision. A perfect evening!